A few years ago, I put in an order at Sparkfun, which included 8 1-Watt Luxeon LEDs. 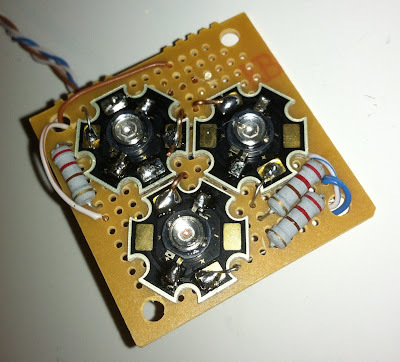 My original thought was that I would rebuild an lightshow device that I had built many years ago, but instead of it driving 110V spot lights through solid state relays, it would instead be more self-contained, and use high power LEDs instead. This project never happened, since I never figured out how to power the LEDs properly. I've recently been getting into doing more little projects, especially since I want to have something to do on Tuesday nights at Interlock. I saw the box of these things on the shelf, and decided to try driving them directly from an Arduino. I know that I could have used one of the BlinkM modules, or the strand of RGB Pixels or whatever for this, but I had these, and I wanted to see what I could do / how bright I could make them without frying the Arduino. The project I decided to work on with them is to make a single high-brightness RGB pixel, and drive it from a Processing sketch on my computer. Eventually, the thought might be to sample a TV's color, 30fps for a few hours, then just store those brightness/color levels. 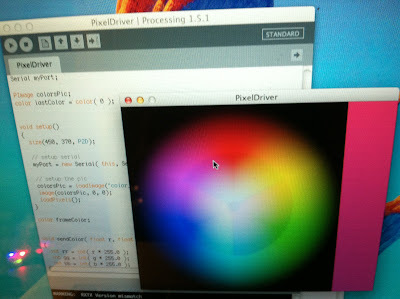 Then, play them back on the pixel to light a room. From outside of the room, it should look like a television is on, showing some kind of TV show. The way I went with testing this was to take a movie trailer, and crunch it down to a few pixels, and then average the colors in it while it plays back, live via Processing, then send the RGB values over USB-Serial to be displayed on the pixel. 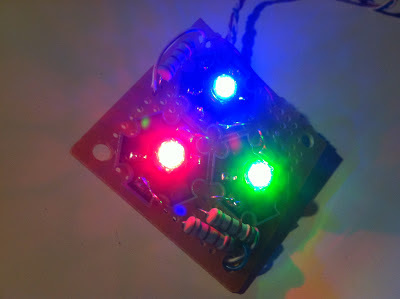 I started out by soldering up a Red, Green, and Blue LED to a small piece of perf board. I tied them together for a common ground on one side, and through a 220 ohm resistor on the other side, and all of this out to the Arduino. 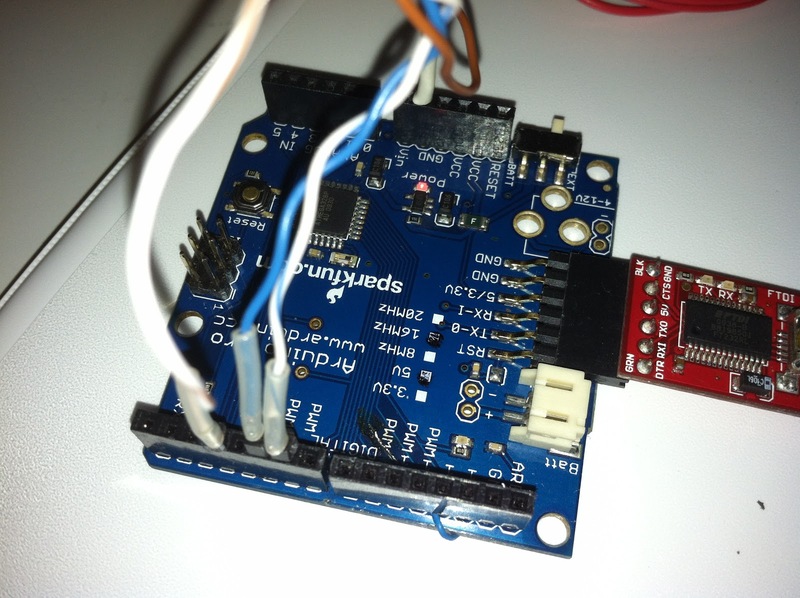 I use PWM pins on the Arduino to adjust their brightness, since that's simple to do. The Processing sketch sends down 0..255 for red, green, and blue intensities, then those values are plugged directly into the PWM pins via AnalogWrite() calls, which displays a reasonable facsimile of the color requested.